The all new Fellowes Powershred W-11c deskside cross cut paper shredder is the ultimate fit for individual shredding needs for homes or small offices. The W11c shredder features a safe interlock switch for added protection, a wide 9" paper entry throat, mechanical auto start/stop, a 5.5 gallon waste bin, and much more to ensure you and your business can remain productive and effecient. With level P-4 secure cross cut shredding into 5/32" x 1-3/8" pieces at speeds of up to 16 feet per minute, the Fellowes W-11c shredder keeps all of your personal or business document shredding confidential and secure. Check out the Fellowes Powershred W-11c cross cut shredder from MyBinding.com today and save. Cut Size: 5/32" x 1-3/8"
Love just how this shredder shreds so much faster than my old one. As many may know, buying a low cost paper shredder always winds up being a bad investment. I would recommend buying the W11C for its Value,quality and its safety features. I purchased the W11C to replace an older strip shredder I had. Appreciate the handle on the head that facilitates lifting the mechanism out of the collection bin! Cons: No handles on he collection bin. Difficult to pick up and move the entire unit without removing top. I just put an appropriately sized Glad bag in the collection bin. No mess! Easy! This is a great little shredder. It shreds quickly, and into small pieces. This was a replacement for a previous Fellowes product that was no longer providing me the efficient and safety qualities I needed. This one is super. Excellent product concept with great safety features. It does the job for my light shredding needs.My only con is that I had to change a faulty electrical male plug, which prevented unit operation(QUALITY CONTROL ISSUE). I haven't actually tried 11 sheets at once, I stick to about 5 at a time, but so far, have shredded hundreds of papers with no jams. I've oiled it two or three times, which I think it crucial. Basket fills up quickly, but for my purposes, which is to keep my private info from getting out, I think it is great. Easy to fit under desk and keep out of the way when I'm not using. Not quiet, but what shredder is? Welcome to MyBinding video. 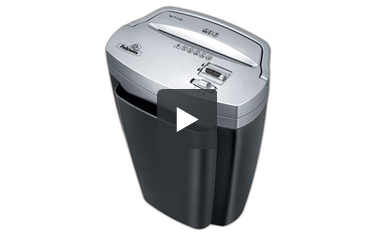 This video looks at the Fellowes W-11C, a deskside cross cut paper shredder. The W-11C is a stylish and easy to use cross cut shredder that does a great job. Step-by-step here's how it works. Place the shredding unit snugly on the top of the trash can. Once plugged in, you cannot turn the machine on without releasing the lock. Simply push the black button down and slide it up. Then you can go forward or reverse. Always lock it when you're done for safety. You can shred cards, credit cards, items with staples, items that are laminated, and up to 11 sheets of 20lb paper per shred. And all items will be shred at a level 3 secure cross cut shred. The waste basket is just below the motor, very easy for disposal. Should you need to free a jam, simply switch the motor over to the "R" reverse side and pull your paper out. That's it. That's the W-11C cross cut shredder by Fellowes. For more demos and reviews of this product and many more, check out MyBinding.com. The W-11C is a cross-cut device so it offers more security than a strip-cut machine. When you insert a piece of paper into it, the paper will be turned into particles that measure 5/32” x 1-3/8”. That’s pretty small so you can be sure that your information (name, account numbers, etc.) won’t get stolen. This shredder can easily shred both letter- and legal-sized paper. It has a 9-inch feed opening so you can shred computer print-outs, correspondence, and so on. (You can shred up to 11 sheets per pass.) If you need to get rid of any expired credit or debit cards, you can run them through the W-11C without any problems. Like many other Fellowes shredders, this device will start shredding automatically. When your paper (or cards) have been destroyed, the motor will stop running so it doesn’t burn out. While the W-11C can’t run continuously for an extended period of time, it can shred for up to 5 minutes straight before it needs a break. It you let the shredder sit for 20 minutes, you’ll be able to use it again. You can fill the waste bin with up to 5.5 gallons of shreds. When the bin gets full, you can simply lift the cutting mechanism off the top and dump the scraps. The device even has a full-sized handle to make things easy. The W-11C is equipped with an interlock switch. When you’re not shredding, just slide the switch to prevent unauthorized use. This is a great safety feature so you can feel comfortable about having this machine in your home. Maintaining this device is really easy. You just need to oil it once in a while which will only take you a couple of minutes. Just run the shredder in reverse for a minute and then squeeze some shredder oil into the feed opening. Insert a piece of paper so any excess oil is absorbed and put the machine back in reverse for a few seconds. You can then continue with regular shredding. This shredder comes with terrific warranty coverage. The cutting mechanism is backed for three years and everything else is covered for one year. These are especially good warranties for a personal shredder. All in all, the W-11C is one of Fellowes’ best personal paper shredders. It will help you get rid of unnecessary papers and credit/debit cards so you can reduce clutter and protect your identity. This device is safe to use and easy to maintain so you can shred without worry. If you need a paper shredder and want something reliable and well-made, you should definitely consider the W-11C. About the Author: Jeff McRitchie is the Director of Marketing for MyBinding.com. He regularly writes articles, reviews, and blog posts on topics related to bookbinding, laminating, paper shredding, and office equipment. More than 2,500 of his articles have been published in thousands of locations on the Internet. If you’re looking for information about paper shredders his articles are a great place to start.